KATIE: I hate to break it to you, Waffles. But there is no Grand-girly's house. 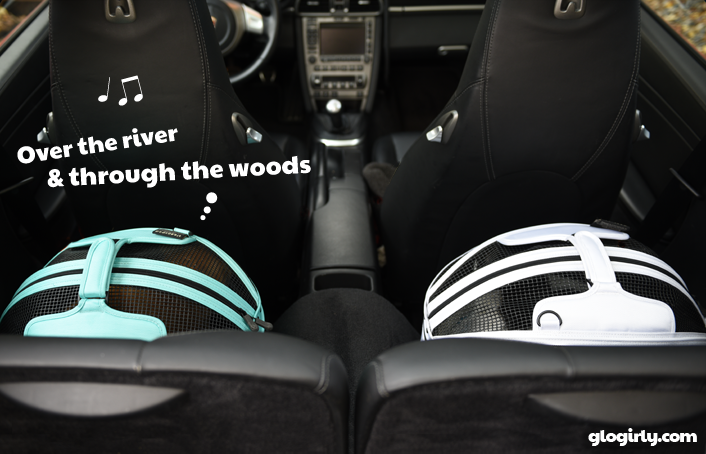 WAFFLES: Then where are we going over the river and through the woods to? KATIE: Right, right, left. Freeway. Left, left, right. That can only mean one thing. WAFFLES: Cool, we're going in circles! Like at the amusement park! KATIE: VET, Waffles. We're going to the vet. WAFFLES: What a ripoff. No cheese fries and no roller coasters? KATIE: Waffles, you're not supposed to eat cheese fries and as for the roller coaster, well life is already enough of a thrill ride when it comes to you. WAFFLES: I still say cheese fries would be better. So who's going first? KATIE: After you, Waffles. Way, way after you. WAFFLES: Ok, Boss. Wish me luck! WAFFLES: What do you mean I have to cut back on my cavalries? KATIE: Calories, Waffles. Not cavalries. That means you're supposed to eat less. WAFFLES: Eat LESS? You mean like less FOOD? WAFFLES: Ok, can we go back to the part where we all get cheese fries? WAFFLES: It's your turn, Boss. Watch out for the one with the gloves. KATIE: Oh, I'm watching out for her alright. And if she's smart she'll be watching out for me. 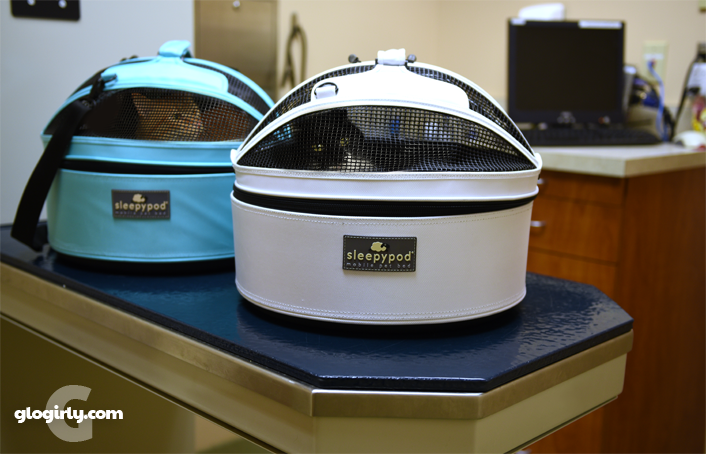 Not even 24 hours after National Cat Day, and the day before Halloween, Katie and Waffles found themselves road-tripping to the vet for their annual physicals. Sounds like way more tricking than treating. Waffles is a happy, healthy mancat. But a little too healthy, according to the scale. 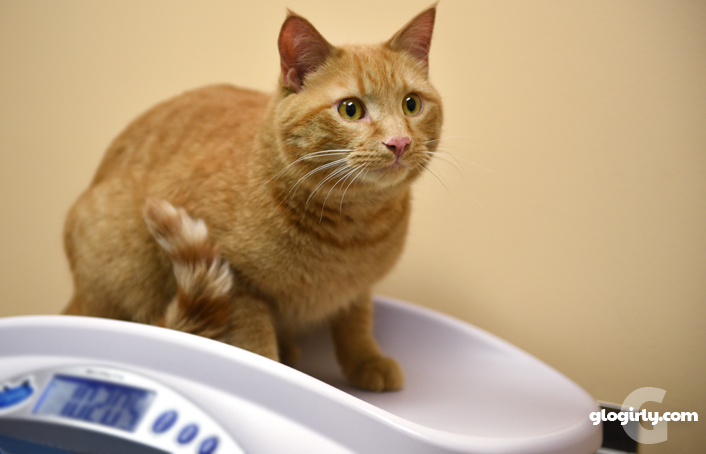 His ideal weight is 10.5 pounds and he's inched his way up to 11. Nothing serious, but his portions are going to be scaled back just a tad. According to the vet, his daily calorie intake needs to hover at about 185. Sorry, Waff. No cheese fries for you. At 10 years old, Katie is now considered a (shhh!) senior cat. 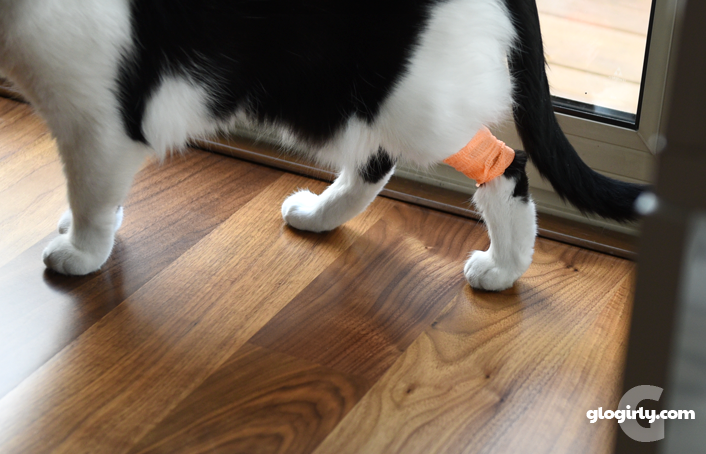 She came home with the senior blood panel bandage of honor. (Orange for Halloween) No results yet, but we're not expecting any surprises. Still, it's a good idea to make sure all is well, what with cats being such masters of disguise when it comes to any ailments. Because of Katie's IBD, she's been given as much food as she's wanted for the past few months. Mostly in an effort to keep her eating regularly and bring her up from 9 to about 10 pounds. Well that worked a little too well. Let's just say the Waffles won't be the only one trimming back his calorie intake. One thing that Glogirly is doing to help Katie feel more full so she's not asking for 5 or 6 meals a day, is adding some warm water to her food. For example, in the morning when Katie gets 1/4 cup of whole ground rabbit, Glogirly adds 1/4 cup of water. So far, Katie is lapping it all up and hasn't been begging for multiple meals. 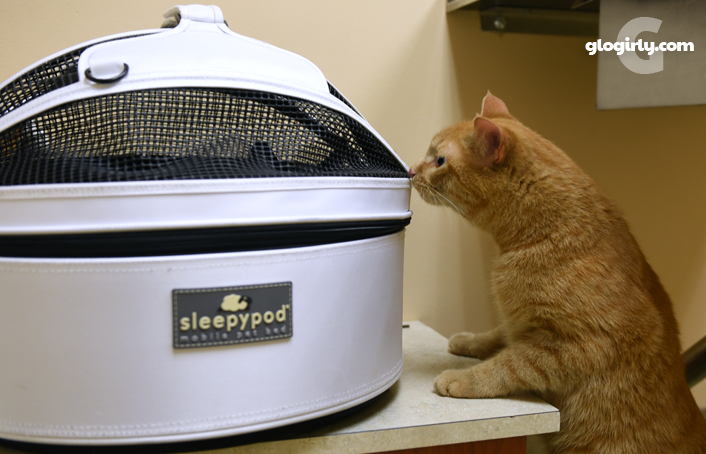 We get so many great comments and questions from people at out vet's office whenever we show up in our Sleepypods. Did you know that they're the only company that conducts actual safety crash tests on their carriers? Whenever we ride, we always buckle up! small commission if you click from our site and make a purchase. Hi Katie and Waffles, my brother Jetta will be going to the vet on Tuesday for surgery. 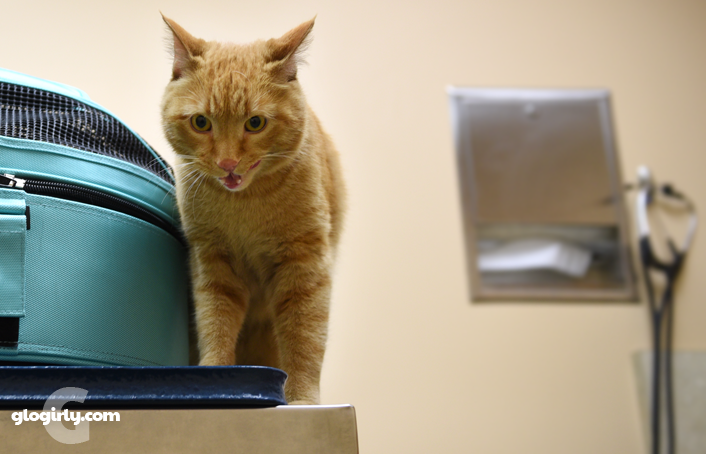 He's having a gingival hyperplasia taken care of. My dad's a bit concerned (worried) but my dad's always worried. We hope that all will be well just like it was for Katie and Waffles. Harry eats his rabbit a little more erm, holistically. Glad Katie and Waffles are doing so well. Good for Katie, good to see you putting on weight! So glad to .hear all.is well! We're glad all is well ...... But it always comes down to portions....... always. We'll take some rabbit and cheeze fries, please. We're glad to hear you got a mostly good report at the vet! What a great idea about the warm water... we'll have to see if that helps with Ashton's hunger between meals, too. Those are cool pods! My Giant Lady needs one one wheels because I's am getting to heavy for hers. Glads everything went well at the Vet, and I's hope you got some treats Katie, after going through that. 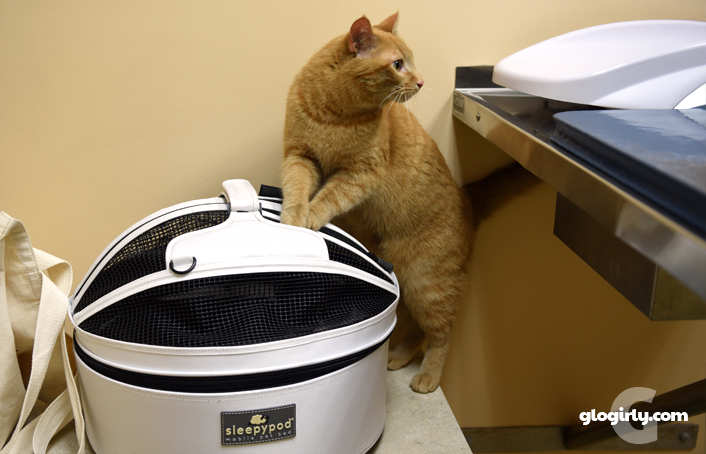 Our vet says Rufus the Red is a typical orange tabby- a food hog! It's a struggle at dinner time to get Mickey Mouser to eat before Rufus comes to devour both cats' dinner. We got back from a 5 day vacation and our cat sitter never even saw Mickey. Rufus is looking LARGE! I love that I could tell who was in each carrier from the very first photo. Purrs to both of them as they deal with calorie reduction..
Goo job at the vet pals. Shhhh. I have to go someday this week my shel. Glad they both had a good vet visit. Mom was just saying the other day what "hefty" kitties she has -- at least me and Ocean. I think we may be in the same boat as you two! Too bad about the cheese fries, Waff. We've heard they're delish! Glad it was all routine and we'll keep our paws crossed for no surprises on Katie's test. I'm glad everything checked out okay. It is definitely ideal to get seniors blood tests once a year to keep an eye on them. By the way, if Katie and Waffles want to give a little of their weight to Carmine, that would be fantastic! He isn't eating nearly enough and keeps losing. So glad to hear the Vet's report we're all good! I am glad all went well. I hope the blood work is good too. Maybe a chicken fry for Waffles? 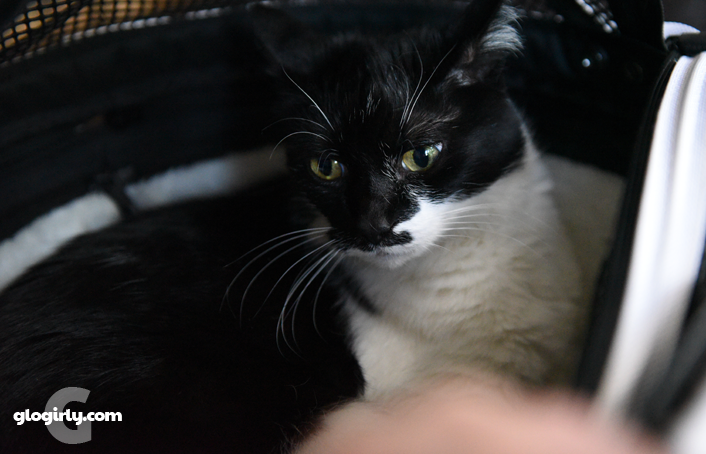 I am glad the vet visit went well. The calorie reduction doesn't sound so good though. My mum keeps trying to get me to eat more. I haven't been able to visit for a couple of weeks because my humans were away, but they are back now, so I am too. Glad all went well! You guys really travel in style! Good work at the v e t Waffles and Katie - hopefully you won't notice the reduced portions. "Watch out for the one with the gloves" had the mom bean laughing out loud. Dunno, I could read the scale Waffles was on and it clearly reads 10.20 which is closer to 10 then 11. Na mean? Katie doesn’t need less food, just more exercise. Get ready to chase her, Waff. Poor Waffles! I managed to keep my trim, handsome figure with lots of exercise, jumping, running and all. I am a svelte 9.9 pounds, so Mum isn't worried about me being too thick around the middle. No more buckets of chick-hen for you, more exercise, but that doesn't mean just jumping to conclusions! Uh oh! I see a vet visit in my future too!! The Staff keeps muttering about my considerable girth! Cheek! I expect she'll try that adding water ploy, but I'll see that coming and head it off onto the best rug!!! My little orange guy Tiger is due for his 1 year vaccinations...I must call the Vet to make his appointment...I hope he doesn't hear me..lol..
We're glad you had a good vet visit!! Allie: *gasp* DIET? THAT evil word? Well, it's a good thing it's not being applied to YOU, Katie. 185 calories - why that's...6 mice. He should be THRILLED. P.S. I'm so glad the vet visit went well, except for the whole diet thing. I had to go that route a few years ago, in fact go totally fat free with my main meals due to a triglycerides disease I have, and I actually get to eat extra because of it. Heehee! I love it!! Been a svelte 12 lbs ever since. This made my day, your cat are so adorable and I bet they love to hop in the vet clinic once in a while to keep them healthy. Not much of cat lover, but I do appreciate the fact that cats, like dogs are really sweet and lovable. Not like the cat owners from Marvelousessays.com review that are irresponsible when it comes to domesticating their cats. allegorical post, i know you aestheticism person because of this you send such kind attractive images. great idea nice one. keep it up!